Acting as a sequel of The Fellowship of the Ring, The Journey to Mordor shows us the Quest of Frodo, Sam and Gollum to destroy the Ring of Power in the fires of Mount Doom. The difference is, now we will watch everything solely from their perspective. No Aragorn, Legolas, Gimli, Gondor and Rohan Kingdom, etc. The Lord of The Rings is one of my favorite sagas ever (yeah, I include The Hobbit too). But something I always see about the films is the fact everybody talks about Aragorn and company's adventure, while Frodo and Sam's Quest is not that well appreciated and not given The attention it should deserve. I believe this is a mistake because yeah, you get to see armies fighting together and fighting against the forces of Mordor. But Frodo and Sam are The ones who actually had the most important task of all: destroy the ring. That is why I decided to make this Fan Edit. In this Fan Edit, we will see The Two Towers and The Return of The King, as this was intended to be a Fellowship of The Ring Sequel, combined in one movie and told solely from Frodo, Sam and Gollum's perspective, to make this an exciting and Dark adventure. The Lord of the Rings: The Fellowship of the Ring footage, which was used to replace some other footage from The Two Towers. Masirimso17 for his wonderful cover and support. I used Sony Vegas 11 for this Fan Edit. 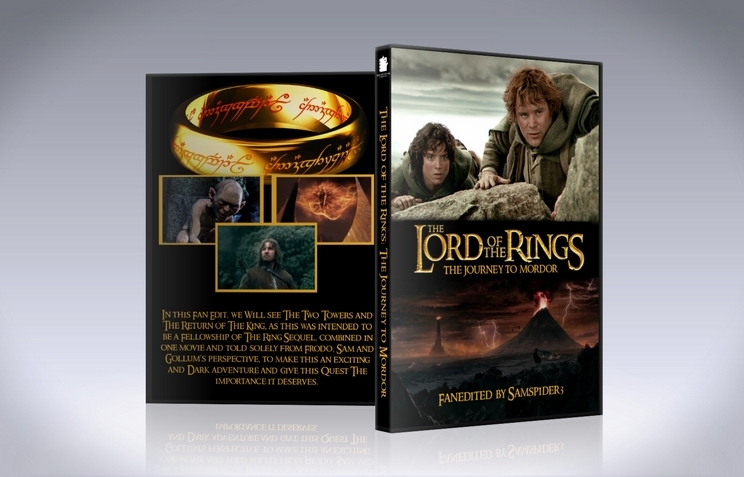 -The Fan Edit opens with Gollum finding the ring and killing Deagol. -We then see Frodo and Sam going down a mountain. -After Frodo and Sam convince Gollum to lead them to Mordor, we cut to the scene where they go to the Swamp. -After failing in going to the Black Gate, we cut to the scene where Gollum tries to get food, Frodo and Sam discussing, Gollum fighting his own persona to finally the scene where Frodo and Sam are taken by Faramir. -After being kidnapped, We see a scene where Galadriel says what is happening outside Frodo and Sam's Quest. Exposition scene to see what is the current situation. The original scene is more like a conversation with Elrond, so I edited it to make it seem like narration. -Then we see the scene where Faramir and company arrive their lair. Faramir's past scene has been kept to help character development. -Frodo and Sam are taken to Osgiliath after all of this. Then we see Sam's Speech where we see what is happening on the Battle of Helm's Deep. I decided to keep these scenes without too much modifications to give an idea of some good things beginning to be alright in the Fellowship and Middle Earth. But I cut all Gandalfs bits to make his appearence at the end of the film and give much more impact to Frodo when he wakes up. -After this, Frodo and Sam are released and then we go to the scene where Gollum is planning kill them. I modified the scene to make the story flow better and connect it to Return of the King. -Then we go to the scene where Sam and Frodo find that old Statue. -After this, Frodo and Sam rest and go to sleep. We see Gollum planning to lead them to Shelob. -Then we go to the scene where Sam and Frodo wake up and continue their journey. Sam gives his part of food to Frodo. -We cut to Minas Morgul scene and the army going out. I cut every single shot of Gandalf and Pippin discussing what the Witch King is going to do. -Sam and Frodo begin to climb the stairs after this. -They decide to rest and then Sam is cast away from the team as in the movie, but then we cut to the scene where he discovers the food in the ground and decides to help Frodo. -Then we see Frodo going to Shelob's lair. He fights Gollum and gets poisoned by Shelob. Sam comes to rescue. -Then Sam goes to Mordor to save Frodo and their journey to Mount Doom. -The scene where Sauron sees Frodo was trimmed to take out all the parts with the armies, Gandalf and the Fellowship. 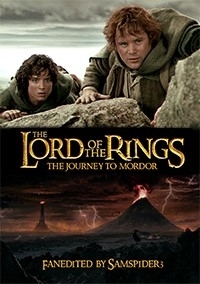 -Sam and Frodo keep climbing Mount Doom, fight Gollum and then Frodo enters Mount Doom. All the scenes where the Fellowship is fighting the armies of Mordor had been cut. -Frodo is rescued by the Eagles, but we don't see it's because of Gandalf until the scene where Frodo wakes up in Rivendell. -Then everything is the same to keep the conclusion to every character and arc in the story. Every time I watch the later LOTR movies, I always find myself impatient with most of the movie and only really want to see Frodo/Sam/Gollum's adventure, samspider3 has come and made that a reality. The editing is terrific, the character arcs work so much more, the movie actually becomes more epic by splitting up these stories. The isolated story makes you relate to Frodo and Sam so much more, and I love it! This is not a replacement for the other movies, but probably m favorite way to watch them. Ok so here's my thoughts on samspider3's take on isolating Frodo and Sam's journey into Mordor. It works very well as an isolated story. Never did I find myself noticing that it was an edited version of the two movies and I think that goes to show the creator has done a fine job there. There was one instant where it seemed like the hobbits advanced a bit in their journey but I don't think that can be helped in any way as their story doesn't get broken up at all with Aragorn and co.
One thing that got to me though was the film starting with Gollums flashback and finding of the ring. I love the idea of seeing the journey through the eyes of Sam and Frodo so to me this feels like Gollums back story should be left to the imagination. If however, it was to be kept it, I could see it working well as a flash back when Frodo says to Gollum, "you were not so very different from a hobbit once". I think some clever editing could insert that flashback into the sequence and then maybe the nazgul screech could bring us back to present. I think that would be awesome in my opinion. I also found Galadriel's voice over off putting when the hobbits were captured. Again, I feel like we should have no outside information other than what is told directly to Sam and Frodo. The only relevance I can see is that they are seen bound and being led as prisoners. Maybe these scenes could just be edited out with some music over the top. Just my thoughts and opinions anyway. Other than that it was very well done and I enjoyed it. The idea of isolating a single storyline like Frodo, Sam And Gollum's, seems simple enough. But having watched samspider3's edit, it's apparent there are a lot of subtle but necessary adjustments to make for a well-flowing journey. And samspider3 has done it superbly. It's remarkable to see how much the experience has changed by simply focusing on a single story - but I found a new appreciation for these characters has the three defined leads. One scene edit in particular I appreciated - near the opening to RotK, with Frodo and Sam camping in a cave-like architecture - has been moved to a slightly later point. Considering that the previous scene chronologically sees Frodo and Sam at a high-point, imagining the stories that will be told of their journey - cutting to the menacing mood in the above-mentioned scene would break the flow somewhat (something that flows perfectly well as Peter Jackson's two separate films). There were some odd moments towards the climax of the two films where glimpses of the other characters would be shown - but I feel like efforts to remove those shots completely may have just felt patch-worked. And it's evident that samsspider3 has consciously included certain shots to make those cut-away's feel most natural. The only real issue I had was the volume balance. I found that the audio was sometimes too quiet or too loud. But apart from that, a great watch for anyone wanting to enjoy these films in a new way.